You are here: HomenextPlacesnextShops and businessesnextDo you remember the shop?nextDo you know where this laundry was? My Great Aunt Kate is in these photographs, but does anyone know what laundry this would have been and where? It was probably somewhere in the Elm Grove area. My Grandmother lived in Bonchurch Road until she died in 1952 but I do not think it is the Cox’s Laundry that was at the top of Bonchurch Road. I think this is the laundry that used to be at the end of Cobden Road in Islingword Road. I had a great aunt Kate who worked in a laundry. What was her last name? Also her sister Annie worked in the same place. Any more details yet? The picture is probably the laundry that used to be in Scarborough Road Brighton. It has now been made into houses/flats. Did you write the article about my Great Uncle Harry Edwards, the photographer? Thank you for your suggestions which I will investigate further. Kate’s maiden name was Jones and she married Albert Russell. I am not aware of a sister by name of Annie. I have not written any photographic articles about Harry Edwards but if you go to http://www.photohistory-sussex.co.uk/BTNEdwardsHenryT.htm you will see I have provided a photograph by H T Edwards. If this is Harry Edwards, can you identify the photo? I too had an Great Granma Annie (Ironer-Laundry) who lived at 33 Carlton Row, in the 20s perhaps she too worked there? Maybe she is one of the ladies in the photos? I’ll keep checking in to see if any further comments added. I’m still researching, so time will tell. I believe it was Sunlight Laundry which was in that area. It was not Wilsons Laundry as this was at Arundel Road, East Brighton Cox’s was a pill factory which was where Sainsburys, Lewes Road, is now. I’ve just obtained a copy of the 1911 census for my great-grandparents. They put the names of their employers on the census. My great-grandmother worked as an Ironer for a Dyer/Cleaner named A. Russell. They lived in Bedford Buildings so it would have been in the Kemp Town area. 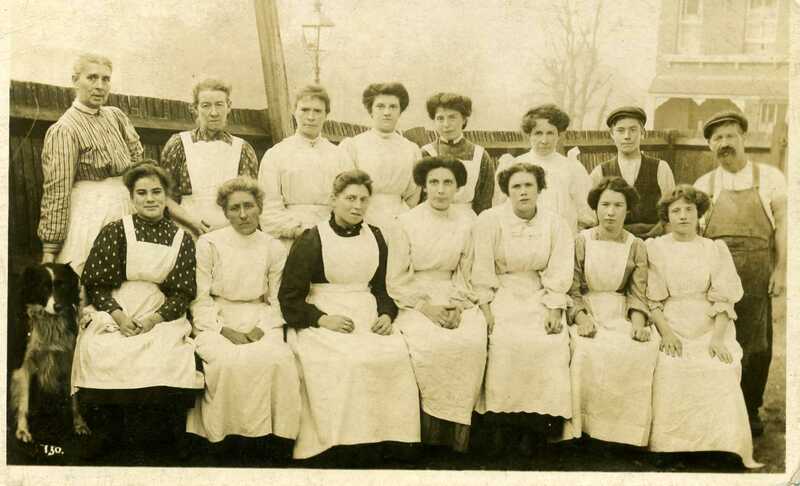 My nanny Thorne(not a relative) lived in Upper Lewes Road and worked at Cox’s pill factory. It could have been the 50s or 60s. There was a laundry around that area called the Primrose Laundry. The laundry at the end of Cobden Road was Gochers and used Morris J2 vans to deliver and collect. My mother and father met at The Soft Water Laundry in Robertson Road, in the Preston area, bottom of Millers Road. My dad drove a Morris PV and then later a Thames 15cwt. My mother Violet Harris (nee Cowley born August 1907) left school at 14 and worked at Gochers laundry in the Islingword Road area. Her mother Annie Cowley (nee Jewell) worked as a specialist ironer (I believe she used a goffering iron) probably at the same laundry. The Cowley family lived in Lincoln Street until my nan’s death in 1959. My mother married in 1933 George Harris who lived in Luther Street. In the first photo, there is a dark haired girl (behind the dog) who could easily be my mother. She also appears in the second photo so the two pictures are from the same laundry. It might be Gochers Laundry. They did have a place at the end of Cobden Road. The laundry was around the corner from Bernard Place, and was made into flats in the 1960s. My great grandmother was the oldest working woman at Wilsons’ laundry age 92. She did ironing – by hand in those days. She had her photo taken by the Evening Argus in William Street where she lived, this was the first time she ever had a photo taken. Her name was Sallis, I believe. She was always called Nan by us kids. I always visited her on Sundays, promising to be a ‘good boy’, getting an old penny and a thruppeny joey for my birthday. I have no firm knowlege where either was but have a gut feeling on both. The one with the cobbled flint wall background is very much a site within the town centre not too distant from the sea and the more level open area with trees seen over the timber fence suggests Queens Park or even Hove. The dog and even some of the staff however are in both photos. Perhaps it is of a laundry that moved to new premises. I am the current owner of Gochers Laundry and have been for two decades. I recognise the flint wall in the picture and can confirm this was the old site of Gochers Laundry in Islingword Road until I closed it in 2001. I have lots of old pictures of staff and delivery vehicles dating back many years. Hope this helps!! jennifer@mybrightonandhove.org.uk. Look forward to hearing from you. This is Wilsons Laundry. Its not there any longer but my sister and myself worked there. It’s great to know that these photos are of Gochers Laundry, would anyone know the date roughly on these, and also wouldn’t it be lovely to find out the names of all those laundry workers? Please – did anyone know my Granny Jane Andrew nee Saunder? All I was ever told was she was a washer woman and had ten children. Sam sold newspapers at the Old Steine, Richard a taxi driver, Joe (my dad) a painter, Bob a bottle washer, George I don’t know and Maggie a sister who died and a brother Steven who also died. It’s Gocher’s Laundry which was in Islingword Road. I have been looking at the bottom photo and the house behind the people in the background. This doesn’t tie up with buildings in Islingword Road. My immediate thoughts was that it was off of Elm Grove. Houses in Bonchurch Road are of a similar design but it didn’t match up when I strolled down google streets. However, I crossed from the bottom of Bonchurch Road over to Hartington Terrace opposite. The first house on the left as you go up is almost identical to the house in this photo. So I needed to find out if there was a laundry on the site opposite. It clearly was a business of some sorts and not houses. From the directories of early 1900’s there was a laundry on this corner (listed under Hartington Rd) called at one point Summerlyn Sparkes and in 1920 it was called Mrs Taylors laundry. Please go onto google streets and compare the house in the background to the one at the bottom of Hartington Terrace and you’ll see what I mean. I really think this is where this bottom photo is and would tie up with where your Grandmother lived in Bonchurch Road. My grandmother Lily Rhodes was living in Bonchurch Road pre 1911 census, she was classed as an ironer launderess, so I am presuming that she worked at one of the laundries nearby. Does anyone know if I could find any records of who would have worked in any of them at that time? Primrose Laundry was at 22 Crescent Road. The sign is still faintly visible on the wall. It was my great great grandparents’ business. 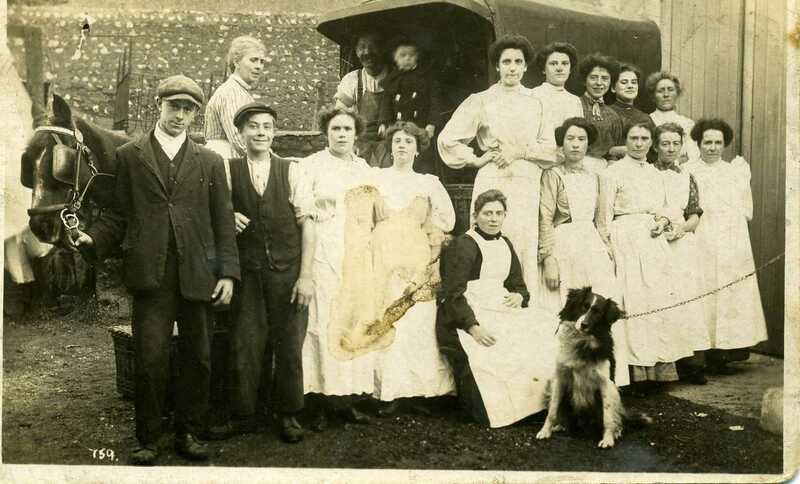 I have some photos of the laundry workers from around 1910 (same period these photos are from), with a similar van, but the laundry in these photos isn’t Primrose – it was still operating in the early 1960s and I used to visit the premises often. Lovely to see it remembered though. There were lots of laundries in the Roundhill area in this period. There is an interesting chapter about them in the book Rose Hill to Round Hill. My great grandfather, Edward Bellamy Benstead, on the 1901 census (his home address) is a laundry keeper / employer living at 12 Hollingbury Road. My mother told me that to get to the laundry he walked through his back garden and that there was a gate leading to the back of the laundry which backed on to his house. His daughters, Mabel and Florence, worked there too. I have looked on a Brighton street map and Hollingbury Road appears to back onto Hollingdean Terrace which is his place of death, he committed suicide 18/12/1922 by hanging himself in the laundry. If anyone knows the name of the laundry or any other info I would love to know. I think I agree with Carol Homewood that it is the bottom of Hartington Terrace. I live at the end house (No 4) which is at the opposite side from the house in the photo and would therefore have been next to the laundry. There is a flint wall remarkably like the one in the top photo and the house looks exactly like the Briars on the other side of the road. The street directories suggest that the site now occupied by flats next to us on Hartington Road was a monumental mason – J Sargent and Sons – but I have always been puzzled about what happened to No 2 Hartington Terrace? Natalie, I grew up at 42 Hartington Road – the distinctive blue house on street view (and I will use street view as a point of reference in this – I don’t know how accurate the pictures are now) - and my paper round started in Hartington Terrace, so I knew the area well in the 1960s & ’70s. J Sargent did indeed have the corner plot, although it was predominantly a display area, facing Hartington Road and about 20 feet from front to back and taking up the stretch between the corner and the next block of flats up (with the hedge and red door). Sargent’s display area was gravelled with a small number of ‘graves’ laid out to display their work, the back was a cream & green corrugated screen with double doors in the middle leading to what I think was a small storage area. The whole was surrounded by a very low brick wall (possibly the one still there) topped by black spike topped railings. Sargent’s actual workshop was where the cream house is between the cemetery entrance and the upper block of flats; the workshop had folding doors across the full width of the frontage save for the side entrance now marked as 97a. There was usually some stones propped up in the front drive and occasionally work was also done out the front there as well. It is worth remembering that in those days, all funerals had to stop at the lodge on the way in to the cemetery and so, especially for big funerals, the cortege could often tail back and be stationary outside Sargent’s giving mourners a view of the wares on offer! Moving up Hartington Terrace, behind Sargent’s screen, came a group of garages where the white walled parking area is now. These were set back from the pavement by about 10 yards and comprised about 3 medium car-sized ones and one much bigger one (van-sized?). They always looked slightly run-down with sludge brown wooden doors. The space in front of them did, however, present an area where we kids could play on the flat in relative safety – many a ball was kicked against those garage doors. I never did know whose garages they were – whether they were lock-ups for the residents or belonged to someone. Between the garages and No 4 was the path that led, parallel to Hartington Road, to the flats that fronted Hartington Road. I remember there was a tall gate and wooden fence at the Hartington Terrace end of the path that made it hard to realise this was the entrance to the flats and the gate was also quite hard to open. In the wider area, I can recall the new houses being built on the corner of Hartington Road and Bernard Road in the late ’60s or very early ’70s. Prior to that the land was effectively an uneven wasteland of rubble known locally to the kids as ‘the dump’ – played on when parents weren’t looking. On the corner of Hartington Road and Brading Road, there were two shops. Originally, No 36 was a corner shop selling all sorts of food mainly – I used to be sent there at a very young age with mum’s shopping bag and clutching a few pennies to buy loose potatoes or a tin of peas or something similar. It became a hairdressers in the early ’70s, I think. The other corner shop was a somewhat cramped newsagent and tobacconist; the proprietor, when I started my paper round (1972), was something of a curmudgeon initially but I found that by being reliable and doing a good job (my round expanded as I filled in the gaps with new customers) he became quite friendly. By 1975, however, he had retired and sold the business to the Scott family who lived at the Cemetery Lodge – this may have coincided with changes to the admission arrangements to the cemetery. The newsagent used to have, on the outside wall facing Hartington Road, a cigarette dispensing machine where dad used to send me, even pre-teens, to get occasional packets of Weights or John Players. It would never be allowed now! Reverting back to the original topic of this page, I can remember the flint wall Natalie alludes to but I can’t recall ever having heard of there being a laundry there and Mum & Dad had lived at 42 since 1945. Further to my previous post I have my grandmother on the 1901 census as a ‘Laundress Wash’, living in Bonchurch Road. On the MyHouse/MyStreet site there were nine laundries in Bonchurch Road at that time. I am trying to find some old pictures of my house 142, Hartington Terrace. If anyone can help much appreciated, or how I can get started in this area, please let me know. Shoaib: The James Gray collection [on this site] has a large collection of images of B&H but not that many of the suburban areas, worth looking through the relevant volume though. The Keep archive at Falmer may have some building plans and other associated material.